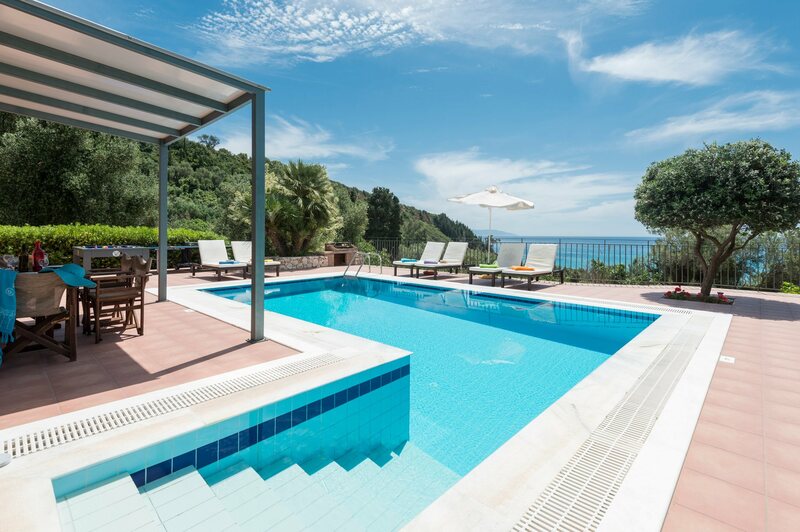 With spectacular sea views, Villa Lourdas Lefkas has a superb location above the popular resort of Lourdas. It's just a 15 minute downhill walk to the centre of the resort, with its beautiful sand and shingle beach plus a good selection of shops and tavernas. Set in mature gardens surrounded by trees, this 3 bedroom villa has its own private pool and fabulous terrace - perfect for lazy days admiring the stunning scenery. Pool heating, WiFi and air conditioning/heating in all the bedrooms are included. The fabulous sea views and superb location, just 15 minutes' walk from the centre of Lourdas. The inviting, L-shaped private pool is set in the villa gardens, with mature hedges and trees providing additional privacy. There is plenty of space to relax on the sunbeds in between refreshing dips in the pool. The shaded alfresco dining area allows you to enjoy your delicious meals overlooking the stunning views, cooked on the brick BBQ. The villa is set in a group of 4 villas, all accessed from a private gate off the main road. There is off-road parking available, with a small path leading round to the front door. The open plan lounge, kitchen and dining area offers a pleasant space to relax after a day by the pool. The space is furnished with comfortable sofas, a flat screen TV and dining table with chairs. 2 sets of patio doors lead out to the pool terrace and frame the beautiful sea views. The kitchen is furnished with traditional wooden cabinets and is fully equipped for your holiday meals. On the ground floor you'll find a spacious twin bedroom with en suite shower room and patio doors opening out on to the pool terrace. There is also a separate WC on this level. Upstairs is a twin and a double bedroom, both of which have en suite bathrooms and large picture windows framing the wonderful views. There is also a small shared balcony on this floor, a great spot to relax with a glass of wine. This villa is registered and licenced by EOT Greek licensing association. This number is: 0830K10000835001. Villa Lourdas Lefkas is a detached property set in a residential area above Lourdas Bay, in a group of 4 villas . The nearest restaurant from the villa is only a short walk away and the nearest mini market is just a couple minutes more. The centre of Lourdas, with its fabulous beach, tavernas and shops, is just a 15 minute downhill walk away. Further afield, the island's capital, Argostoli, is only 30 minutes' drive away. Our villas Lourdas Kerkyra, Lourdas Kefalonia and Lourdas Ithaki are all in the same residential road. . The nearest mini market is just 625 yards from your villa, great for stocking up on your holiday essentials. There are a number of little shops in Lourdas if you are looking for some souvenirs to take home, but for a greater selection head to Argostoli. Here you will find some good clothes shops as well as a local market selling fresh fish, fruit and vegetables. Lourdas has a good selection of local tavernas serving traditional Greek cuisine as well as fresh seafood. With a laid-back atmosphere, you can easily while away an evening admiring the beautiful sunset with a cold drink or glass of wine. Lourdas Beach, often referred to as the most beautiful in Kefalonia, is only 15 minutes' walk downhill from your villa. With the longest stretch on the south of the island, the sand and shingle beach has sunbeds and parasols for hire as well as small motor boats in the summer months. The best way to explore the island's beautiful coastline is by boat, so why not be your own skipper for the day? Rent a boat from Lourdas Beach, pack a picnic and discover the secluded coves, bays and small beaches. The island's capital, Argostoli, is a harbour town and well worth a visit for the shopping alone, as well as the local museums and fabulous tavernas. Or why not head to Skala, 30 minutes' drive away, with not only a great beach but also a fascinating history. Take a self-guided walk around the old village, walk along the ancient walls and stop off at the old Roman villa, where you can see the spectacular mosaics. If you are feeling active, Lourdas has some wonderful walking routes through the surrounding countryside. Or, if you are in Skala for the day, why not rent bikes and explore the coastal paths? Villa Lourdas Lefkas is not available to book for season as it is sold out. Take a look here at the Kefalonia villas that are currently on sale.